Enamel PF 115 whose technical characteristics are not inferior to brand paints from the best manufacturers in the world, has excellent adhesion to almost all building and construction materials, is very simple to use, safe in an environmental sense and has good decorative properties. In addition, it is waterproof, not afraid of ultraviolet radiation, quite elastic. 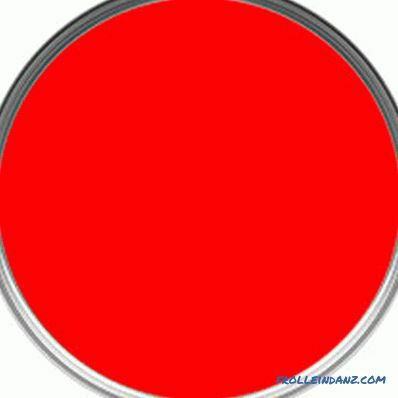 About these and other properties of popular paint will tell in more detail. The PF-115 enamel, well-known to professional builders and owners of private houses, appeared on the market in the distant 1960s . 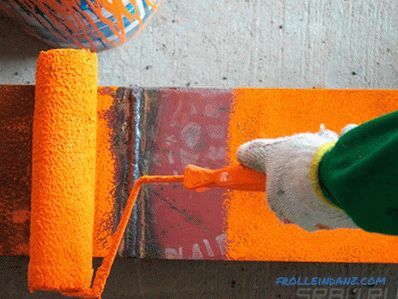 Until now, it remains one of the most practical paints for various kinds of repair and construction work. The paint owes such durability not only to a low price, but also to a number of unique consumer qualities. The paint is produced almost unchanged from the day it first entered the market. Regulates its composition GOST 6465-76. 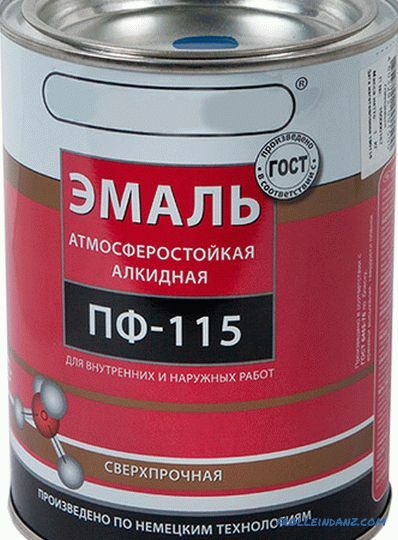 If you want to use the classic PF 115, then buy paint, made according to GOST. Many manufacturers make changes in the chemical composition and produce paint on TU. It is very difficult to guess whether its properties have been improved or degraded; it can only be verified experimentally. 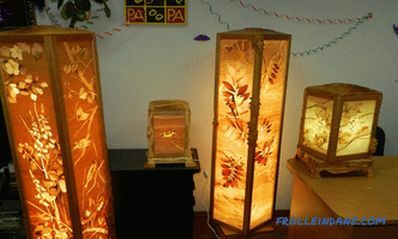 But there is not always time to do this, and not everyone can afford to buy paint, albeit inexpensive, for experiments. In the name of PF 115, the chemical composition and main fields of application are encrypted. 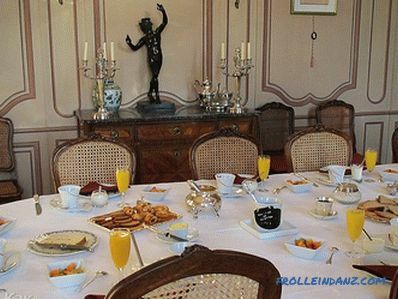 The index is understandable to the specialist, but does not tell the ordinary buyer about anything. However, the information is very important. The letter symbol PF means that pentaphthalic lacquer (a type of alkyd resin) acts as a paint binder. 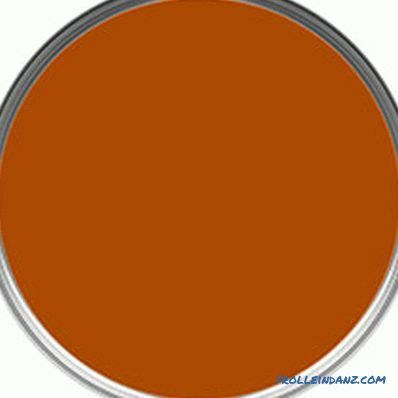 Scope of pentaphthalic paints - exterior and interior work on a wide range of materials. 15 - the number of the chemical composition is determined GOST and decoded by the manufacturer. In its physical state, PF-115 paint is a suspension, a suspension of solid and liquid particles of various kinds in a liquid medium. Particles are represented by solvents, dyes, pigments, desiccant, titanium dioxide and other fillers. The basis is a rather viscous pentaphthalic lacquer, which is dissolved with white spirit or other organic liquids. 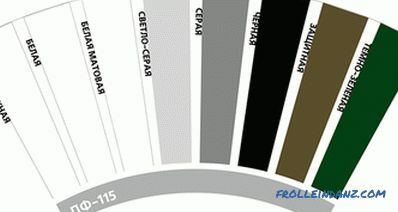 In the classical form, the composition of the PF 115 paint includes various components, depending on the color. Different types of enamel differ both in the number of components and in their percentage ratio. But the feature of this paint is that regardless of the composition, the main operational properties remain unchanged. 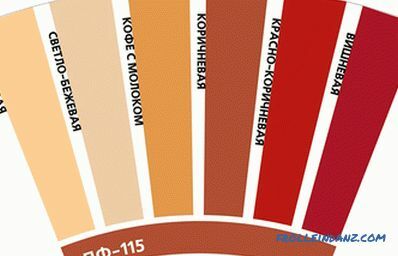 Paint is produced in ready-made colors; you can change the shade only by mixing different modifications of the PF 115 in a certain proportion. Moreover, by mixing a precisely metered test amount of different inks and obtaining the desired color, you can proportionally increase the volume of the components and prepare the necessary paint supply of the desired hue. For example, consider the composition of the most common types of PF 115 paint, the technical characteristics of which largely coincide. 3. white spirit - 10%. The paint produced according to GOST corresponds exactly to this chemical composition and the coating will have the qualities specified in the paint passport. As already mentioned, the paint has a number of properties that are quite unique in this combination, which allowed the composition to withstand stiff competition and hold out on the market for over half a century. At the same time, enamel is one of the most popular, which in itself is a unique phenomenon. 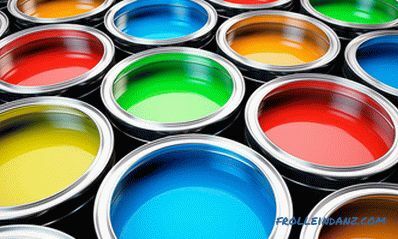 Due to its properties, PF-115 enamel requires careful handling, especially when used and indoors. Before work, it is necessary to check the operability of the ventilation and the absence of sources of open fire. The use of heat guns, both on liquid fuel and electrically heated, is also not recommended. Due to its high viscosity and excellent adhesion, the use of PF 115 paint has a wide latitude. It is not suitable only for roofing work - with strong heating of slate or tin sheets, cracks may appear and the color changes dramatically. Enamel is used primarily for exterior work on structures exposed to open air. It is used both as a monolayer coating, and as part of a multilayer, in combination with primers, anti-corrosion and antiseptic impregnations, insulating layers. Enamel does not have its own antiseptic and bactericidal properties, therefore such additives are necessary when processing wood and walls made of brick or concrete in wet conditions. It has PF-115 enamel and very high decorative properties - according to GOST 6465-76 it is produced in 22 colors and shades. 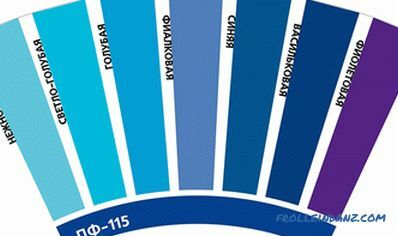 In recent decades, manufacturers offer a modernized paint, which is available in almost all colors of the RAL scale. In this case, the number of colors from the catalog is indicated on the cans or barrels of paint. This is one of the few cases when it is preferable to buy paint that is not made in accordance with GOST, rather than standard. 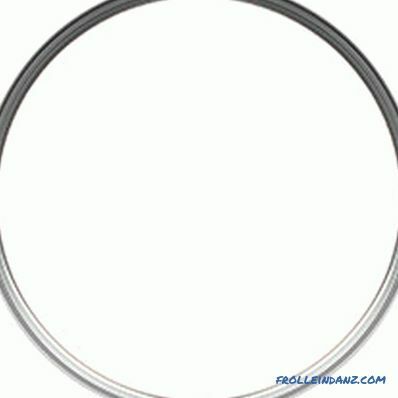 But it is necessary to consider that this type of enamel is more expensive than usual due to the use of expensive dyes. High elasticity of the film, which can be obtained by painting the surfaces in two or more layers (a single-layer coating is applied only when updating the previously completed finish with the same paint, provided that it does not have cracks and swelling) allows applying PF 115 in completely different climatic conditions . 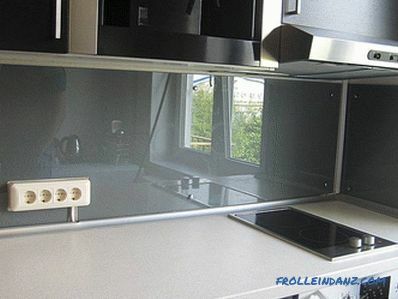 The temperature range in which the finished coating retains its properties is incredible - 50 ... + 60 0 С. But the paint fully complies with the declared characteristics only if all the technological rules for applying the coating layer are observed. How to use the enamel will tell further. Waterproof alkyd enamel PF 115 can be applied with any type of paint tool - brush, roller, spray. When calculating the amount of paint needed, it is imperative to take into account the peculiarity of the painted surface and the color of the paint. Concrete, brick, unpolished wood absorbs the paint quite intensively and its consumption will be more than when covering planed wood, metal or previously painted surfaces. The calculation is given for single-layer coloring. In determining the real, the number of layers is multiplied by the figures given and multiplied once more by a factor of 0.9 — less paint is used for each subsequent layer than for the first. Apply the second layer no earlier than 24 hours after the completion of the previous coating. The surfaces are painted only ideally dry, heated to a temperature of at least +5 0 C. It is optimal to perform painting work using PF 115 in dry, calm weather at ambient temperature in the range of +15 ... + 22 0 C.In this case, the paint will maintain optimum viscosity, the solvent will not evaporate too quickly from the surface, and the risk of the appearance of streaks will be minimized. The application method also affects paint consumption. When using the roller, it will be larger than the brush, and the sprayer can lead to some waste of composition. Also, the average consumption depends on the quality of surface preparation for painting and compliance with standard paint application schemes. Metals of all types are painted with enamel only after priming with compounds GF 0119, VL 05, GF 021 or their analogs compatible with pentaphthalic paints. In the primer index, the number 0 must first be placed. 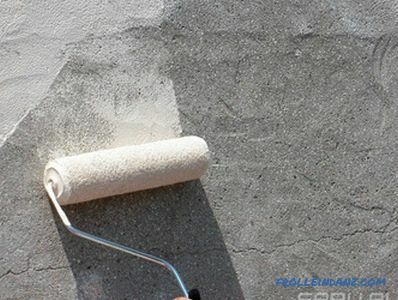 If there are no primers, and the surfaces are not very responsible, then PF 115 enamel itself, diluted with white spirit up to 50% of the original density, can be used for the soil. Surfaces bearing corrosion traces are treated with rust inhibitors (converters) of the Unicor type before the primer. These compounds are applied after mechanical cleaning of the metal from rust and grease. They turn corrosion products into strong and dense compounds that are not hard at all in terms of solid metal. Metals are painted with enamel PF 115 in two layers. On a tree enamel is applied without a primer in 2 - 3 layers. 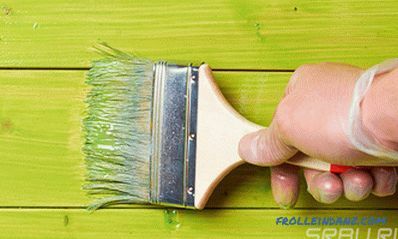 If there is a need (recommended), to treat the wood surface with fire retardants, antiseptics and fungicides compatible with pentaphthalic paints. 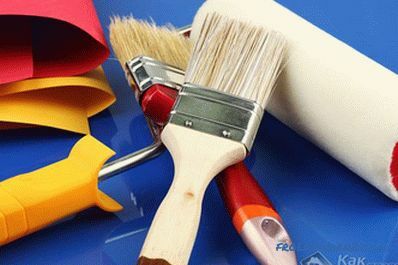 Manufacturers of paintwork materials offer a wide range of such compositions, but when using them, you must carefully study the instructions - some of them are designed for acrylic paints, some act as self-coating. These materials are painted with enamel in 2 - 3 layers without a primer. But it is desirable to use anti-mold preparations - enamel forms a dense surface with low vapor permeability and residual moisture can cause favorable conditions for the development of mold and mildew in the material mass if spores of pests remain there. When painting any of the materials, the surface must be thoroughly dust free and dried. Residual moisture should not exceed 10 - 15%. Fresh concrete walls and foundations, as well as brick structures can be painted no earlier than six months after installation. The interval between the application of the next layer of paint - at least one day. In most cases, in the original packaging, the paint is sold completely ready for use. 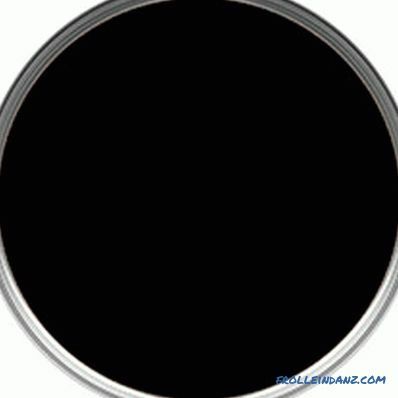 But after opening the can, the solvent begins to evaporate rapidly and the enamel density increases. To bring the paint into the working consistency, white spirit or solvent is used, as well as mixtures thereof. Gasoline and kerosene are not recommended to apply - although they dissolve the enamel, they significantly change its hue and gloss. 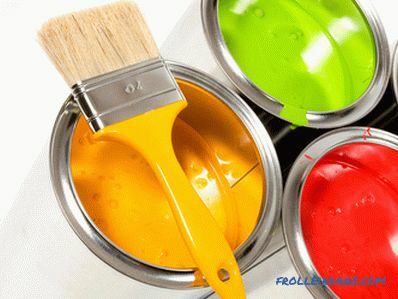 When preparing paint for work, it must be thoroughly mixed by adding solvent in small portions. In the process, the paint also need to be periodically mixed.